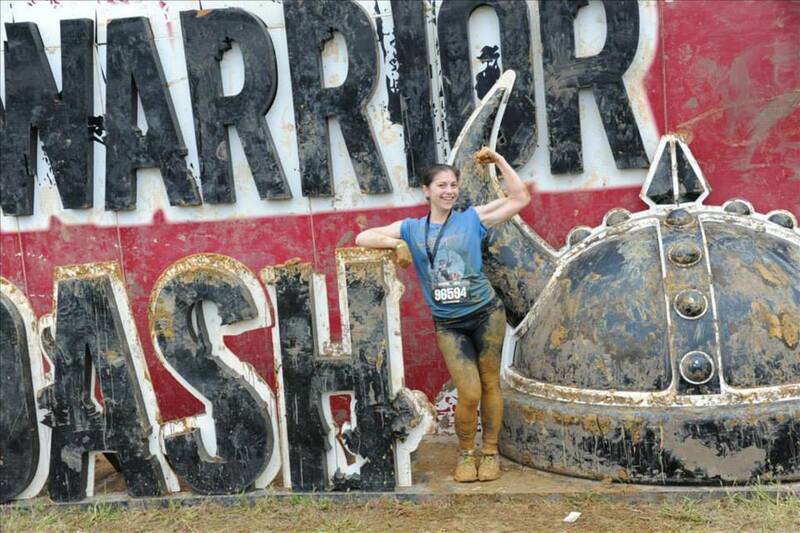 There was really only one obstacle on Warrior Dash that I felt unsure of my ability to tackle. They call it “The Great Warrior Wall.” For as grandiose as it sounds, it’s just a 15 ft. wall with a rope hanging down the side. There are no footholds. Once you get to the top there are a few handles to help you down the other side, but it’s getting there that is the challenge. I’d thought about it for weeks. I could never climb up the rope in gym class, never do a pull-up or a chin-up to save my soul, and only recently found enough upper body and core strength to do REAL push-ups. Surely, I could not climb a wet, muddy, 15 ft. wall with nothing but a thick rope to help me up. I didn’t count on being angry. It’s strange. 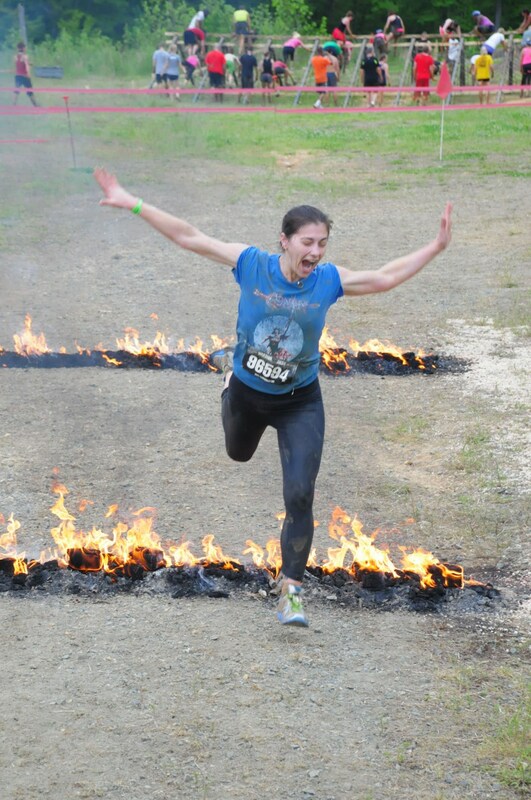 I always tell myself how much I need to approach situations with a positive mindset, but I learned a valuable lesson the day of Warrior Dash: Sometimes you can’t. And then? Well, you make the negative work for you. “See? Just like that. See how she’s leaning back and using the rope for leverage?” I realized that I wasn’t on the ground anymore. In fact, I’d passed the panicked woman and was almost at the top ready to throw my legs over and climb down the other side. Her friends were pointing me out. I had no idea how I’d gotten there, but remembered the thought that passed me by mere seconds beforehand. The wall I’d thought about, dreaded, and planned a thousand ways to tackle was almost entirely behind me without even enough time for doubt to creep in. Because I was angry, hurt, and had absolutely no clue who I was. I was feeling such a loss of identity that it took away all of the negative thoughts I had about myself in addition to the good ones. So instead of assuming “I can’t”, or thinking “I can,” I just did. Granted, the sentence, “I’ll show you, you son of a…” probably flitted through my mind with more clarity than I’d like to admit. But I climbed that damned wall. Not only did I climb it, but I barreled through 3.6 miles and 12 other obstacles covered in rain, mud, sweat, tears, and even a little bit of my own blood. And 3.6 miles later I elatedly threw my mud-caked feet across the finish line. I rode the adrenaline high, took pictures, enjoyed a steak with my husband and father-in-law, went home, and burst into tears. The race had been the ultimate distraction since finding out the day beforehand that I’d lost my job. It doesn’t matter how many times the powers-that-be tell me that my position’s elimination was just the way the cards fell in our department’s reorganization, it still feels as though I have been left behind and left out of something I put my heart into making really special. And the sense of loss I feel over no longer being with my colleagues every day has been overwhelming. 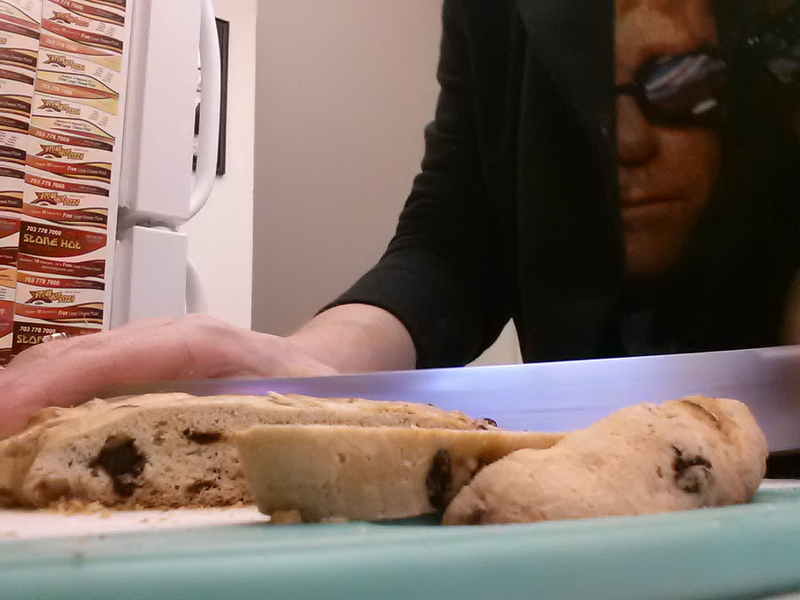 I’ve always said that I have the best coworkers (why else would I bake cookies for them every week? ), and having that taken away is honestly one of the most emotionally challenging things I’ve gone through this year. You climbed the wall you never believed you would climb. And you will climb this wall too. And it began with letting go of the anger, and letting in the thankfulness for what I have had over the past five years. As my last weeks at the Folger go by (all too quickly), I find myself baking a lot more—just wanting to get in those last few treats to share with everyone at morning coffee. 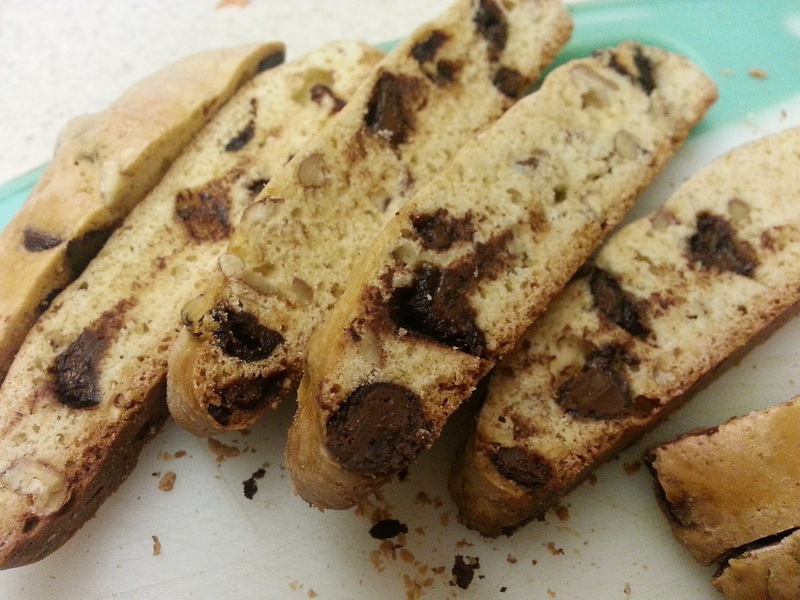 What goes better with coffee than biscotti? Biscotti (plural of biscotto) comes from the Latin word “biscoctus,” which means “twice-baked.” Historically, it refers to items which were baked twice in order to dry them out for long-term storage. 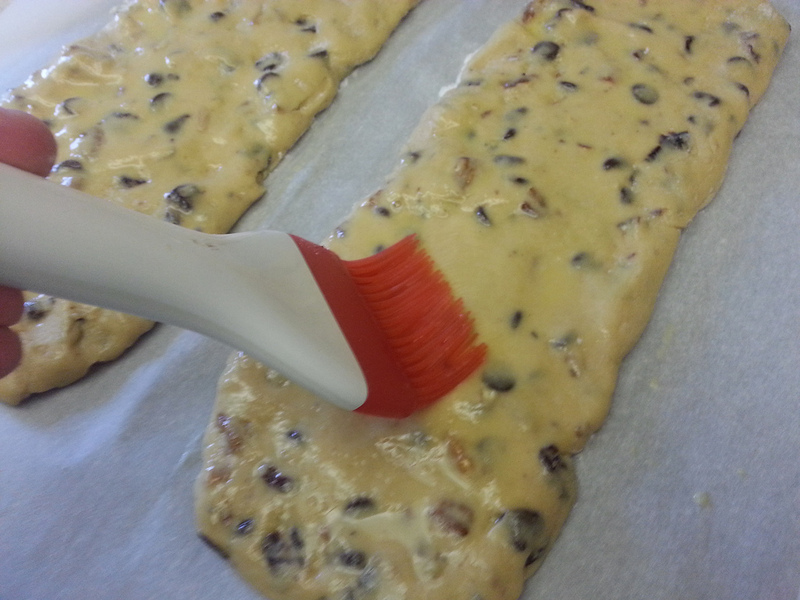 The baking process, and the lack of fat that could easily go rancid, renders them somewhat nonperishable. 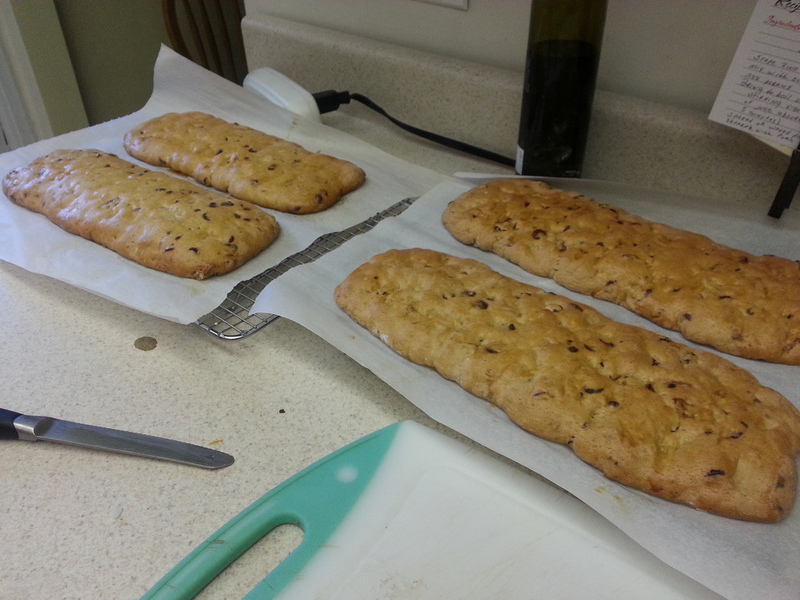 These cookies are also referred to as cantuccini in parts of Italy and Argentina. 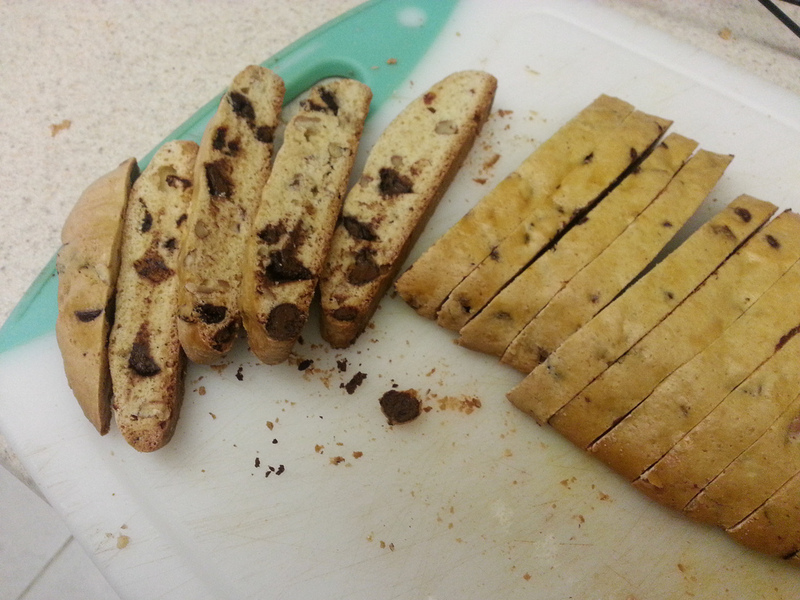 Aside from being mail-friendly, I love biscotti because they pair well whether you’re a wine or coffee drinker, they’re a really tasty but not-too-sweet cookie, and they are extremely versatile. For this iteration, I picked flavorings centered around finding that perfect complement to your beverage of choice. Pecans for an earthy, nutty flavor; semisweet chocolate for rich sweetness with a little bitter note, and finally dried sour cherries for some tartness. I’ve tested their deliciousness alongside coffee and found it to be just right, but you’ll have to do some more extensive testing to find out what wine you like with them best ;-). Cook’s note: My photos show a double-batch, so do not be alarmed at the volume. The written recipe makes 2 loaves (approximately 40 cookies). Preheat an oven to 325 degrees F and line a baking sheet with parchment paper. Beat the eggs with the sugar and brown sugar until thick. 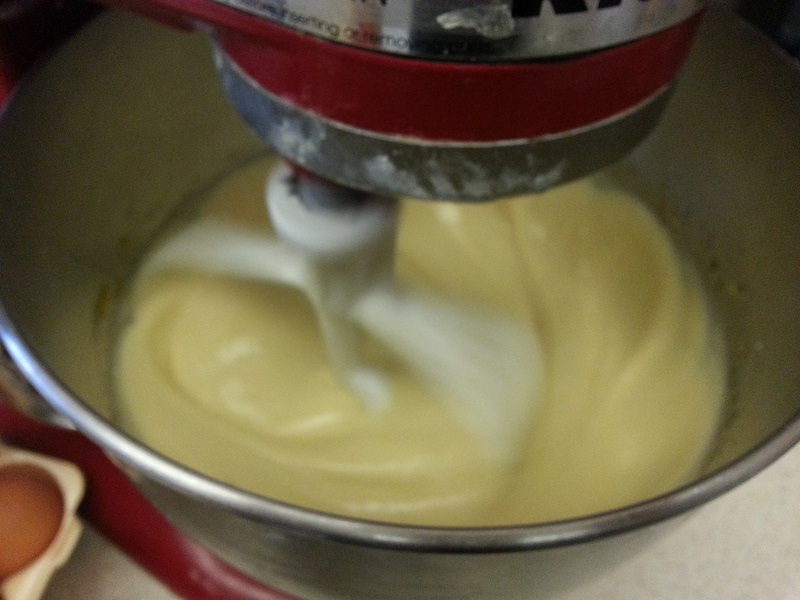 It will take about 3 minutes in a stand mixer set to medium speed. Add the vanilla extract. 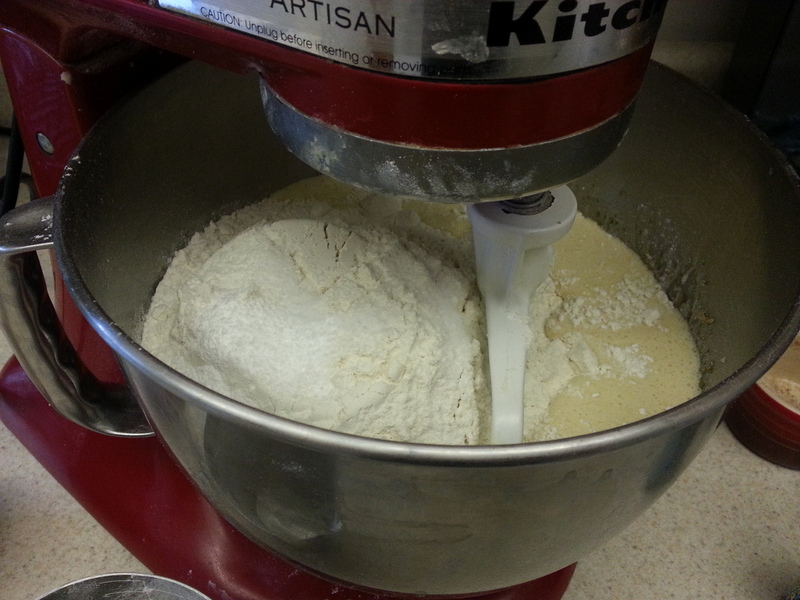 Add the flour, baking powder, and salt to the egg/sugar mixture and stir to combine. 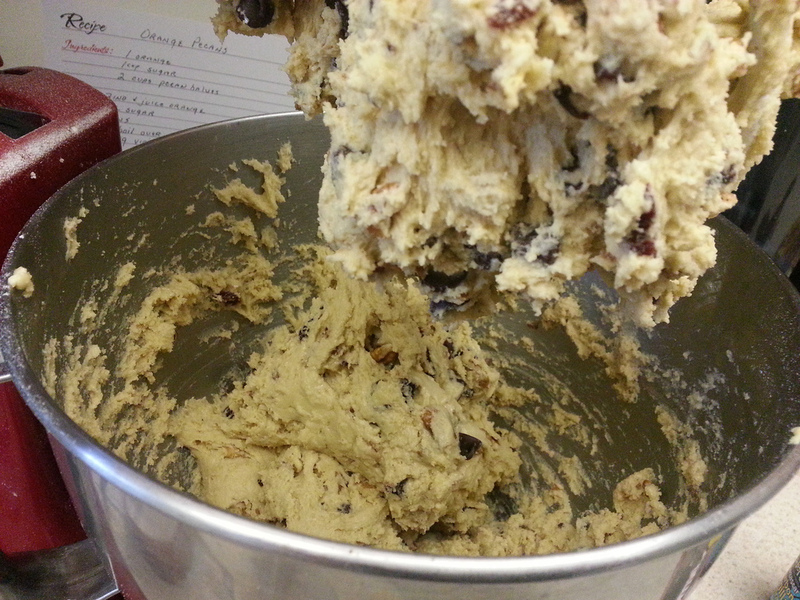 Stir in the cherries, pecans, and chocolate chips. 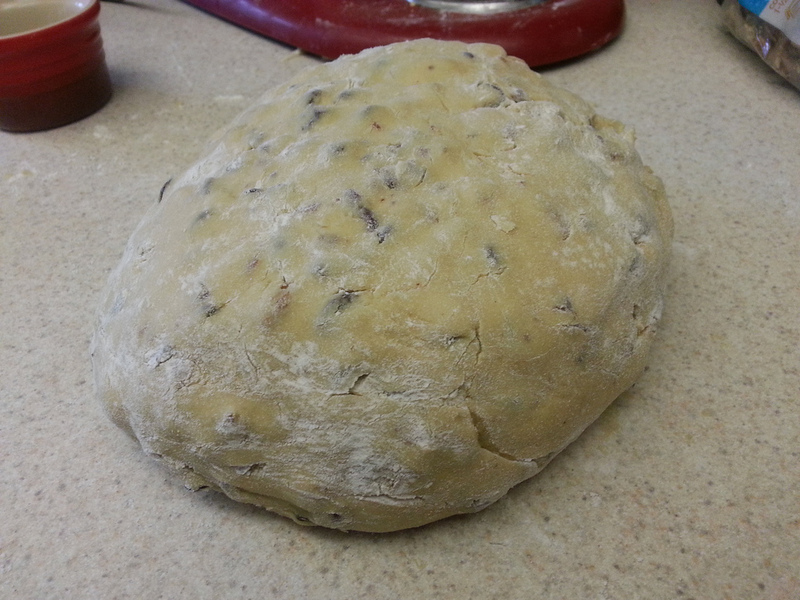 Allow the dough to rest for 5 minutes and then divide it in half. Roll each half into a log about a foot long, place on the baking sheet, and then flatten the logs so that they are 3-4 in. wide. Brush the loaves with egg wash and then bake them for 40 minutes, rotating the pan once to ensure even done-ness. Remove the loaves from the oven and lower the oven temperature to 275 degrees F.
Cool the loaves on a wire rack for 5-10 minutes, and then cut into 1/2 in. slices. Arrange the slices standing up on a baking sheet. They do not need to have a ton of space between them, but they should not touch. Bake for 22 minutes and then move to a wire rack to cool completely. Store in a well-sealed container. If I can let my coworkers know anything before I head off toward whatever adventure lays in front of me, it is that they are important, they are loved, and they will always, always be welcome in my kitchen. It may not be as close as my picture-laden office on the second floor, but I can guarantee a steaming cup of coffee, a smile, and at least one delicious cookie at the little brick townhouse in Arlington.